For the last two decades, the energetic and deep currents off southern Africa have seen persistent scrutiny. Found on the western edge of the South Indian Ocean, the Agulhas Current system exhibits complex circulation patterns—retroflection, meandering, and rings. They show large variability from year-to-year. Plus these flows mediate exchanges between three of the world’s major oceans: Indian, Atlantic, and Southern. Even more important, the Greater Agulhas Current is now suspected to influence the global climate system. Its role is to precondition waters that later enter the downwelling part of the global overturning circulation. Measuring these currents has been challenging. To capture their extent, measurements need to reach deep. To resolve changes over time, measurements need to be sustained. And to survive, persistent measurement methods need to withstand the energy of these powerful currents. For example, surface drifters, floats, and gliders are quickly swept away. 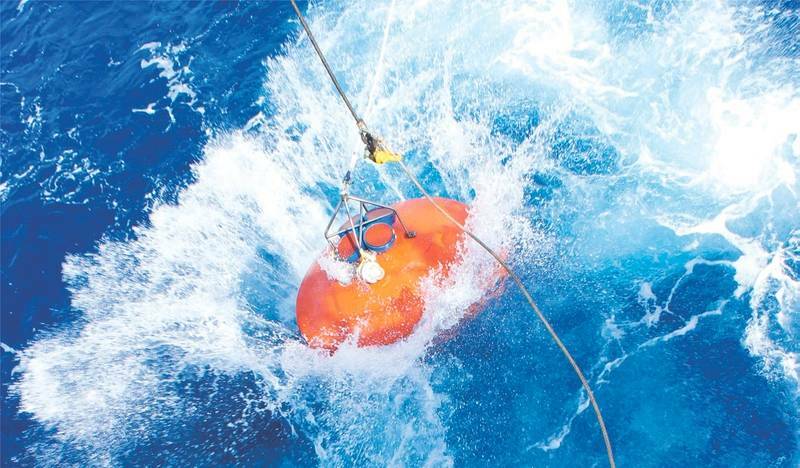 Programs making long-term measurements of major ocean currents rely on resilient moorings. And for measuring strong currents in the upper ocean, these moorings carry ADCPs. 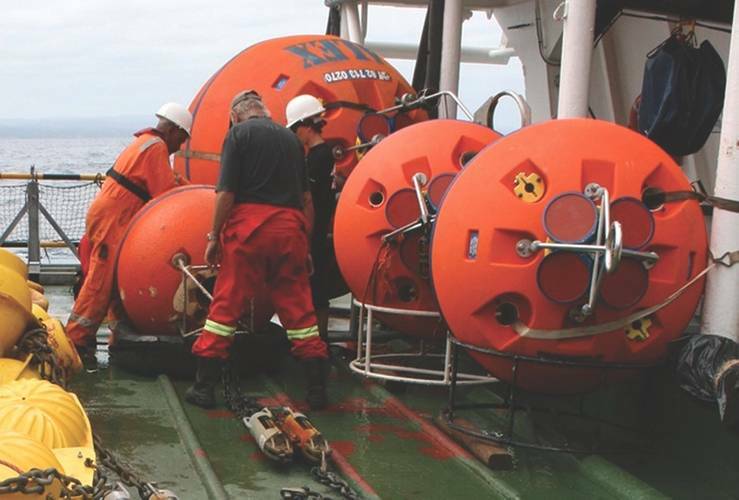 In this report, we review several consecutive campaigns over two decades that used Teledyne RDI ADCPs to measure the Greater Agulhas Current. To help capture this incredibly dynamic system, each campaign fixed ADCPs atop mooring lines and on the seabed as part of extensive observational arrays. For a decade, Dutch scientists focused on the strength, variability, and structure of upstream flows feeding the Agulhas. Later, off the south-east corner of South Africa, U.S. researchers completed the Agulhas Current Time-Series Experiment (ACT) that monitored for three years. One use of their data was ground-truth to create a long-term satellite-based index for changes in the Agulhas Current. And now, an ongoing multinational program continues the work—Agulhas System Climate Array (ASCA). It is collecting persistent observations for at least five years to explore regional and global impacts—notably climate matters. The Agulhas Current streams poleward off the east coast of southern Africa. This major current exerts diverse influence—locally and globally. For southern Africa, the Agulhas affects things from marine transport and regional weather to local biodiversity. More globally, the Agulhas water properties are now linked to earth’s climate system. About one-sixth of the volume carried by the Agulhas leaves the Indian Ocean for the Atlantic. Paleo studies suggest that amount has varied over eons. Below the tip of South Africa, meanders in the Agulhas close off and morph into large-diameter rings. These rings propagate far westward into the central S. Atlantic. They provide a source of warmer and saltier waters to the returning limb of the global overturning circulation. The upshot for climate studies is a heightened interest in how these rings vary. Related research has considered what triggers their antecedent—meanders in the Agulhas. In turn, this fixed attention on eddies entering the Agulhas system farther upstream. To unravel this complexity, the Greater Agulhas Current system has been scrutinized with extensive and persistent moored arrays for the last two decades. A critical element was capturing the volume transported by strong currents in the upper ocean. For this reason, many of the mooring lines were topped with uplooking Teledyne RDI ADCPs. On a side note—ADCPs have a long history in these waters. In the mid-1980s, Prof. Fritz Schott (University of Miami) made early use of uplooking ADCPs atop moorings off Africa, including the E. Madagascar Current. By the late 1990s, scientists were uncertain that a continuous boundary flow existed off Mozambique to supply the Agulhas. To clarify the issue, Dutch scientists conducted the Agulhas Current Sources Experiment (ACSEX) in 2000-2001. The study was performed by NIOZ (Netherlands Institute for Sea Research) and its partners. The project focused on the strength, variability, and structure of currents. Seven moorings spanned the Mozambique Channel for one year. 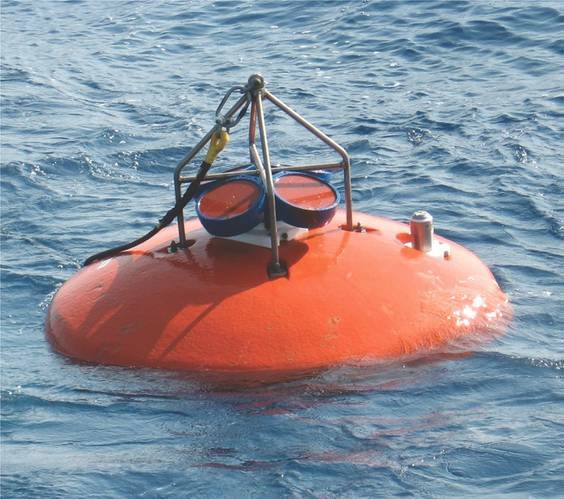 Uplooking ADCPs were installed at 500 m depth on the western side where a boundary current might be expected. A compelling finding was that the amount and direction of water transported through the Channel fluctuated remarkably—much larger than the year-long average value. The researchers concluded that there was no persistent Mozambique Current. Water mass and property transport through the Channel were due to a regular train of large (300-km diameter) eddies moving southward. The passage of these eddies was clear in the ADCP and current meter data. This helped interpret satellite data. The combined analysis reinforced ideas that eddies drifting southward were dynamic catalysts. Not only do they spark mesoscale variability in the Agulhas Current but they affect the volume of water transferred into the Atlantic. Due to its intriguing findings, ACSEX became a springboard for a much longer observational study. This was a component of the Dutch global-research program titled Long-term Ocean Climate Observations (LOCO). Beginning in 2003, NIOZ and its partners installed seven deep moorings at 17° S, across the narrowest part of the Mozambique Channel. The LOCO project redeployed the extensive mooring array several times. The full array was sustained for seven years and a reduced array even longer. The upper 500 m contained the strongest currents. In the initial array design, six of the moorings were topped with upward 75 kHz ADCPs from Teledyne RDI. On the western side of the Channel, moorings had near-bed ADCPs to see an Undercurrent, which is directed equatorward. The data set spans many years with consistently impressive spatial coverage across the Mozambique Channel. As the available record lengthened, the Dutch scientists examined different facets of volume transport through the Channel. In particular, this longevity is needed to see links with remote current systems in equatorial and Indonesian regions. The researchers discerned that variability in the transport could be sorted into three categories. For shorter time scales, the recurring large eddies passing southward dominate changes in transport. These estimates became more statistically reliable when based on the longer data record. For seasonal periods, modest changes in flow volumes were linked to wind-stress patterns over the Indian Ocean basin. At interannual time scales, changes much larger than seasonal variations were found. 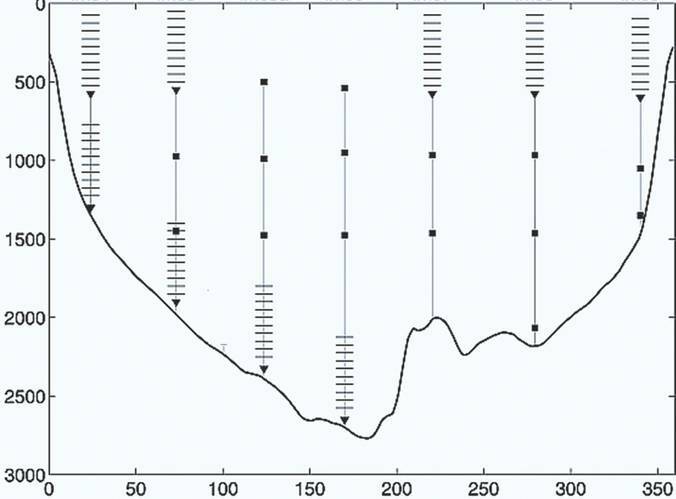 These swings in volume transport were attributed to large-scale climate fluctuations. The latter are identified by a regional climate index—IOD (Indian Ocean Dipole). Exposing the details of this subtle climate connection was possible due to the long duration of the data set. Notably, a lag of almost 12 months was found between changes in the IOD climate index and corresponding variation in water volumes supplied to the Agulhas Current. Farther south, another extensive moored array spanned the Agulhas Current from 2010 until 2013. This project was the U.S. Agulhas Current Time Series Experiment (ACT), led by Prof. Lisa Beal of University of Miami. Located at the south-eastern coast of South Africa, in waters to 4700 m depth, the ACT section was set along a ground track of a satellite altimeter. The mooring array comprised seven full-depth moorings. Initially, each mooring was topped with an uplooking ADCP to monitor strong flows in the upper 350 m. Peak speeds were almost 2 m/s. In a later deployment, moorings near the core of the Current were terminated deeper. They carried an uplooking 75 kHz Long Ranger ADCP to measure currents in the upper 500 m.
The Current was about 200 km wide and reached 3000 m depth. The water transported was 84 million cubic meters per second. A similar discharge was reported for the upper 2000 m of the Gulf Stream where it leaves the U.S. coast. In addition to quantifying the volume of water carried by the Agulhas, the mooring data revealed how that transport changed with season. These observations provided ground-truth that supported prior satellite-based results. Previously, the latter had been questioned. The phase of their annual cycle was “nearly opposite” to results from computer modeling and to observations farther north in the Mozambique Channel. This validation with the moored measurements was essential for the scientists to be able to use the altimeter data as a 20-year index of the Current’s transport. This index offered a much longer record for examining seasonal and interannual changes in the Current. Of significance was the response of the Agulhas to intensifying global wind patterns since the 1990s. The mean flow of the Agulhas has not increased. This finding is at odds with some theoretical expectations. Rather, the distribution of the current field is now broader—attributed to enhanced eddy action. One knock-on effect is greater exchange of water properties with coastal waters. Such changes in the nutrient supply could affect regional fisheries. 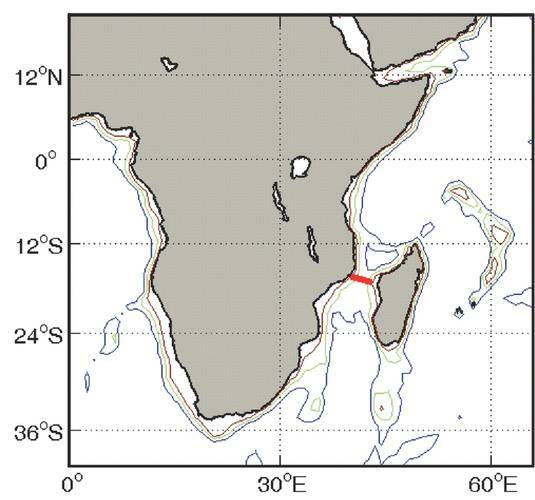 Beginning in 2015, the Agulhas System Climate Array (ASCA) occupies the same transect as ACT, near 34°S. The project includes scientists from several nations. They aim to collect persistent observations of the Agulhas Current for at least five years. The ASCA array includes nine moorings reaching 200 km offshore. In deep water are seven tall moorings to 4500 m. Closer to shore are two seabed moorings near 100 m depth. The latter use 300 kHz ADCPs whereas the deep moorings carry 75 kHz Long Ranger ADCPs. These time series will document variations in the fluxes of water properties as well as the volumes transported by the Current. Two aspects attracted special interest: changes over several years and exchanges with coastal waters important for fisheries. In addressing its climate aspect, the ASCA project will consider a basin-wide context. Oceanic transport of heat will be emphasized. The ASCA scientists plan to merge results in the Agulhas Current with information from the interior. The latter come from satellites and Argo profiling floats. These other sources will quantify large-scale mechanisms (e.g., wind, remote ocean circulation) that are suspected to cause variability in the Agulhas system. Scientists especially want to examine ideas about the response of the Greater Agulhas Current to a changing climate—notably global wind systems. The influence of major ocean currents on our living environment—from hurricanes to earth’s climate—is now more widely appreciated. Yet developing this understanding has been—and remains—challenging. A mix of methods is needed to clarify the long-term effects of global warming. Moored arrays i major ocean currents provide an essential ingredient. Insights have come from researchers using computer models and satellite-based observations. And drifters, gliders, and floats can provide snapshots. Yet there is no substitute for hanging around in these deep and energetic flows. For scientists to see long-term trends and large-scale connections, these moored arrays must collect sustained time series. Their instrumentation and mooring lines must be resilient. And high-speed upper-ocean currents must be measured. 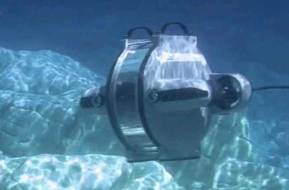 For all these ocean-observing requirements, Teledyne RDI ADCPs remain a uniquely relevant solution.